GPFS includes a wealth of user space applications and helper scripts that can be used by administrators to setup and manage the file system. A significant number of these binaries have the setuid flag set, meaning they are potential targets for a local privilege escalation. By targeting the setuid tsstatus binary and exploiting a insecure TCP based communication channel between this binary and the file system daemon mmfsd, we were able to trigger a format string vulnerability and execute a shell with root privileges. This issue was assigned CVE-2015-0197. In order to enable communication between user space libraries and the GPFS kernel module, the module generates a device named /dev/ss0 that can be accessed by unprivileged accounts. Communication is implemented using IOCTL calls and each IOCTL handler performs its own privilege checks. When looking for functionality exposed to unprivileged users, we were able to identify the IOCL call kWaitforFlock. kWaitForFlock contains a trivial arbitrary memory write that can be triggered by an unprivileged attacker. This issue was assigned CVE-2015-0199. While this makes the first two vulnerabilities quite interesting for an attacker, a bug in the network communication daemon allowing a direct compromise without the need for a local user account would be preferable of course. In order to start a communication with the daemon, a client has to send a valid hello packet. This includes a unique cluster id, timestamps and the IP addresses of source and destination node inside the TCP payload. As we noticed during our research the only authentication mechanism in the default installation is a IP address check to make sure the source node is part of the cluster. However, this check uses the IP address stored inside the TCP payload, which of course can easily be manipulated by an attacker. By faking an IP address we can start communicating with the cluster as if we were a member node. By design this already allows us to manipulate files stored on network shared disks and to disrupt the normal synchronization methods used by GPFS. However we were mainly interested in a direct command execution vulnerability. Authentication is only based on these IP addresses, which allows an attacker to talk with the daemon as if she was a legitimate part of the cluster. This opens an extremely large attack surface and by abusing a command injection vulnerability in a certain message type, we were able to execute arbitrary commands with root privileges from a remote system. Due to the GPFS architecture, this bug cannot be fixed easily and can at this point in time only be fixed by enabling SSL with client certificates for the cluster communication. 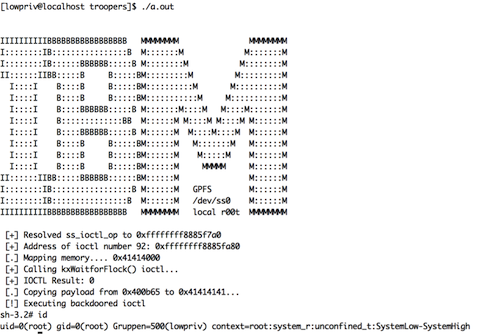 After spending some time mapping the different message types we discovered the MMRemote message that included a command injection vulnerability allowing us the direct execution of arbitrary commands with root privileges. This vulnerability was assigned CVE-2015-0198. Because the missing authentication support between cluster nodes is a design issue of the GPFS protocol the released patch does not fix this underlying issue. Instead IBM recommends all users of GPFS to enable SSL with cert based authentication for their cluster communication. IBM’s security advisory and information as for the patches can be found here. If you any questions or feedback feel free to comment on this post or contact me or Florian directly.